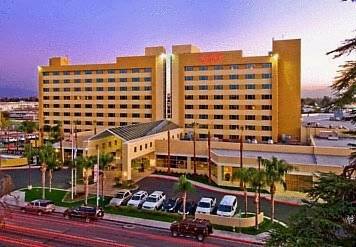 The Bakersfield Marriott at the Convention Center is located in the heart of beautiful downtown Bakersfield. Unique amongst hotels in Bakersfield, we are a full-service Bakersfield convention center hotel that is connected to the Rabobank Arena, Theatre & Convention Center complex. Featuring ten meeting rooms and 9,136 sq ft of total meeting space, our Bakersfield, CA hotel is ideal for meetings, training, and conferences. Enjoy our hotel's high-tech guest rooms and suites featuring 49" smart LED TVs, high-speed wireless Internet access, luxurious bedding package and luxurious amenities. Concierge level rooms and suites offer an added level of sophistication unrivaled by other Bakersfield hotels. After work, guests can enjoy the endless options for shopping, dining, or simply enjoy an evening at our hotel's restaurant - The Nines, featuring fresh, American cuisine in a contemporary, upscale setting. Stay in the heart of it all at the luxuriously appointed Bakersfield Marriott at the Convention Center. The Nines Restaurant: We offer traditional American Cuisine in a Casual Atmosphere. m.i. Greatroom: This restaurant's downtown Bakersfield location and casual lounge atmosphere make it the place to meet before and after concerts and games. Featuring a Starbucks coffee station, 5-10-20-menu, free wireless internet, it's also great for social gatherings. The Nines Private Dining: Located inside the Nines Restaurant in Bakersfield, CA, this private dining facility is available for parties and meetings. Due to the creation of custom-designed menus for each occasion, this Bakersfield restaurant requires advanced reservations.